With a stay at Hotel Rose Garden, you'll be centrally located in Dhaka, within a 15-minute drive of Gulshan Ladies Park and Bangladesh Army Stadium. 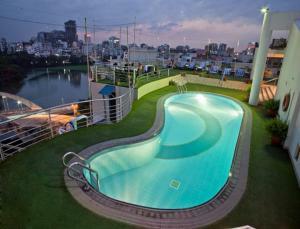 This hotel is 5.5 mi (8.8 km) from Bangladesh National Zoo and 1.7 mi (2.7 km) from United Hospital. Make yourself at home in one of the individually decorated guestrooms, featuring refrigerators and minibars (stocked with some free items). Rooms have private balconies. Wired and wireless Internet access is complimentary, and LED televisions with cable programming provide entertainment. Private bathrooms have deep soaking bathtubs and rainfall showerheads. Make use of convenient amenities such as complimentary wireless Internet access, gift shops/newsstands, and a television in a common area. Additional features at this hotel include tour/ticket assistance and barbecue grills. Getting to nearby attractions is a breeze with the area shuttle (surcharge). Satisfy your appetite for lunch or dinner at the hotel's restaurant, or stay in and take advantage of the 24-hour room service. A complimentary local cuisine breakfast is served daily from 7 AM to 10 AM. Featured amenities include a business center, limo/town car service, and complimentary newspapers in the lobby. Planning an event in Dhaka? This hotel has 400 square feet (37 square meters) of space consisting of a conference center and a meeting room. For a surcharge, guests may use a shuttle from the airport to the hotel at scheduled times and a train station pick-up service. When would you like to stay at Hotel Rose Garden ? Each day we'll check prices and send you an email for your selected dates at Hotel Rose Garden. If you don't have specific dates but would like to check prices for say next weekend or say next month we can check the price too. Click to write a review and share your experience of Hotel Rose Garden with other travellers.